I served as an instructor for the ﻿﻿Semester in Environmental Science﻿﻿ , a semester-long research intensive program for undergraduates. I led a module on canopy processes and scaling photosynthesis, and mentored independent student projects. I was selected as a Summer Teaching Scholar by the Graduate School of Arts and Sciences at Columbia University based on an original syllabus I developed on Urban Ecology. In this course, students used the setting of New York City as a living laboratory of ecology and environmental science. I organized field trips around the city to observe bird habitats in Jamaica Bay, restoration projects in Pelham Bay Park, and urban planning in Central Park. I served as a teaching assistant for the cycle of introductory courses for Ecology, Evolution, and Environmental Biology majors. Responsibilities on paper included developing test questions, leading weekly lab sessions and discussion sections, organizing study sessions before exams, and responding to regular questions about content. Responsibilities beyond that included a lot of emotional support for students dealing with frustrations and disappointments of their first science class at a hyper-competitive undergraduate college within a research university. For two years as a New York City Teaching Fellow, I taught ninth grade Human Biology (original curriculum) and Regents Living Environment at the Urban Assembly Academy for Government and Law, a public school located in the Seward Park campus in the Lower East Side. 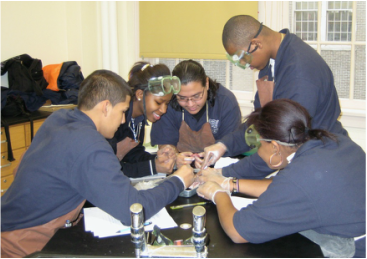 Ninth graders dissecting pig hearts in 2008. I am a scientist mentor for Planting Science, an online learning community that links classrooms with plant scientists to work on experiment development and inquiry. In 2017, I was a participant in the NSF funded Digging Deeper program that brought high school teachers and plant scientists together to strengthen the program's modules on photosynthesis. Enjoying the fruits of Ely, MN with Nur after a few weeks of gas exchange! Field work on the North Slope of Alaska, 2010. LiCor City, New York, 2013. Melissa presenting her independent project for SES, 2015.